tightens a cutting wire between bracket and rip fence for cutting slices even not parallel. 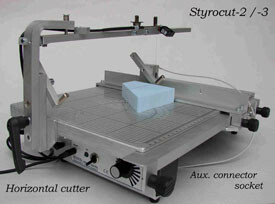 Cutting height up to 120 mm (4.7 in), cutting width up to about 300 mm (12 in). No danger of wobbling because workpiece lies flat upon working surface.